Osaby is accessible to everyone. Anyone wishing to use Osaby’s land or buildings is welcome. We can offer pleasant, beautifully located premises for weddings, parties and conferences etc. Osaby Manor has a long and interesting history, the earliest record of it being from the 15th century when the manor’s first owner, the aptly named ‘Grönalöv’ (Greenleaves), lived there. 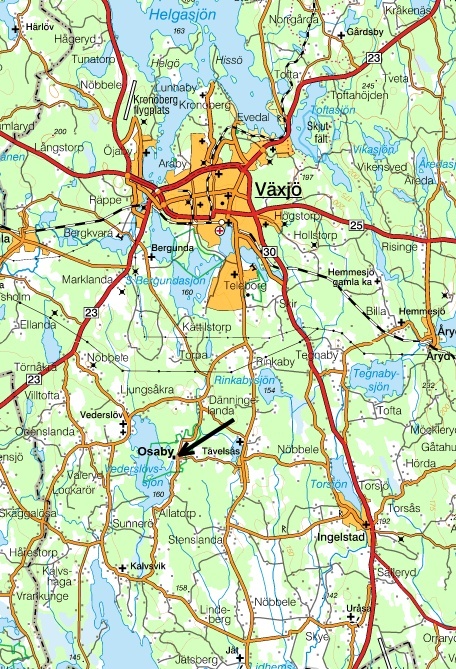 Osaby lies in the former borderlands between Småland and Denmark, and the farm was ravaged by fire in 1542 at the hands of Nils Dacke’s insurgents during one of the many border conflicts. From the middle of the 16th century to the beginning of the 18th century, the Ulfsax family lived here, followed by the Hederstierna and Bennet families. The last family to live in Osaby was Frans Törne with his daughters Ingeborg and Stina, both nature enthusiasts, who donated the property to the Society for the Conservation of nature in 1964. 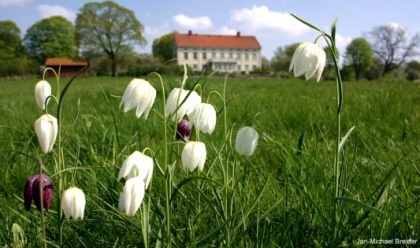 Since 1994 the management and economy of the farm has been in the hands of Smålands Natur, an association whose purpose is to promote the care and protection of the countryside. As a basis for this there are around ten inventories describing approximately 1000 species. The association is also working to provide visitors with an enriching experience of the countryside. A maple-lined driveway leads from the main road to the main building, which is surrounded by a spacious two-acre park with walnut trees that provide shade on hot summer days, and 300-year old oaks that have survived many a storm. The main building, beautifully situated with a view over Vederslöv Lake, was built in 1853 by Lieutenant General Erland Hederstierna. Osaby was then a lively manor with a thriving park, blossoming flower beds, gentlefolk and servants. Osaby is a popular venue for wedding receptions and other festivities. Conferences are held in the main building and in the ‘loft’ of the adjacent building. Overnight accommodation is available in both the main building and the hostel located in the former coachman’s lodge and the adjacent hunter’s lodge. Parts of the park’s former glory began to be revived in 2005-6. A footpath was laid from the main car park to the southern part of the park winding its way past flower meadows, damson groves and the orangery, which was built around 1880. The orangery was once used to store delicate plants in winter and for growing grape vines in the summer. The herb garden was built in 1995 and is situated to the north of the main building. Herbs such as parsley, savories, mint and lavender are grown for cooking and for their scent. There are also potherbs such as rhubarb, Good King Henry and garlic. Among the medicinal plants are St. Johns wort, valerian and marshmallow. There are also plants for dyes and textiles, such as flax, woad (for blue dye) and weld (yellow). The number of plants varies, but around 200 species are represented. The herb garden is surrounded by clematis, honeysuckle and roses and is open daily to visitors from May through September. 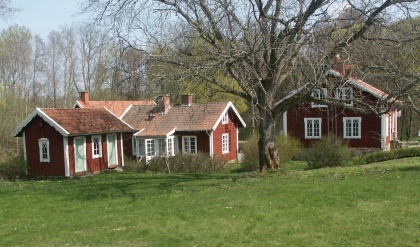 The grounds of Osaby Manor cover 500 hectares and are owned by Naturskyddsföreningen (the Swedish Society for Nature Conservation). In the surrounding countryside there are oak groves and grazing land, a manor landscape dominated by deciduous woodland typical of the woodland and arable landscape of southern Sweden. Since 1994 Osaby has been a 345 hectare nature reserve, of which 130 hectares consist of lakes and waterways. The Swedish Forest Agency administers the reserve. 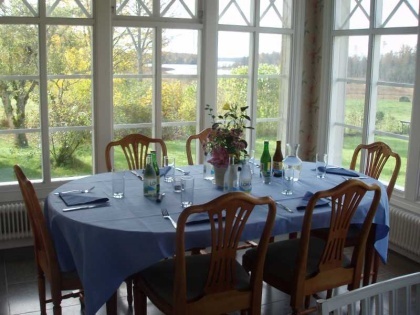 The management is carried out in consultation with Smålands Natur. 50 hectares of 90-year old pine forest, destroyed by hurricane Gudrun still lie in the reserve. Nature trails have been created to enable visitors to discover the flora and fauna. These trails begin at the main car park and are well signposted. The Manor’s woodland has an environmental certificate. The forest is now reduced and badly damaged by the storm and by bark beetle attack. There is also a game management scheme, and the farming, carried out by tenant farmers, is certified by KRAV, the Swedish society for organic produce. A hundred or so head of livestock keep the landscape open. Smålands Natur works actively with the development of the area to maintain the cultural landscape and to keep it accessible to visitors. The old coachman’s lodge and the adjacent hunters’ lodge today make up Osaby hostel. In the background can be seen a third newly built building, whose loft is used for conferences. Osaby has large open grazing land. 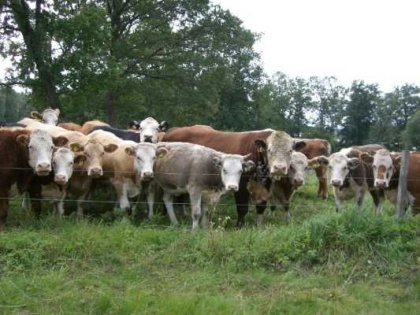 The grazing animals keep the landscape open and contribute to the preservation of the rich flora. View over Vederslöv Lake from the veranda of the main building.